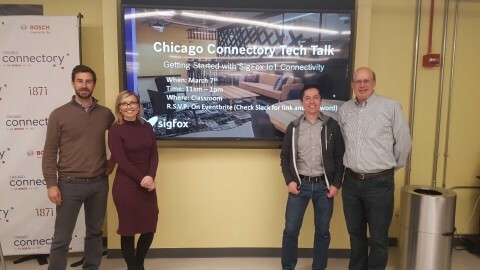 CHICAGO--(BUSINESS WIRE)--Sigfox U.S.A., the U.S. network operator for the global 0G network Sigfox, hosted its first Sigfox Tech Talk at the Chicago Connectory as part of its cooperation with the IoT co-creation space. The event, which took place on March 7, kicked off efforts to foster IoT entrepreneurs in the greater Chicago market by helping them to ideate, innovate and accelerate connected solutions on a global scale. The collaboration between Sigfox U.S.A. and the Chicago Connectory is rooted in their shared goal of supporting startups with the knowledge, skills and support needed to successfully get started in the market. Further trainings will be hosted as a way to further support startups. “We are excited to be working with Sigfox U.S.A. to educate startups on the availability of technology to support their business growth,” said Fermin Fernandez, manager of the Chicago Connectory. Different IoT tools – ranging from free connectivity and developer kits to hands-on workshops, individual coaching and an online course platform – will be made available to participating startups. These IoT-based companies will benefit from the technical information and business resources needed to jumpstart their projects and save time. The startups will also have access to Sigfox’s global network, giving them the opportunity to work with some of the best incubators and venture capitalists in the industry. Additionally, they can tap into Sigfox’s dedicated team of engineers and experts to receive technical training and gain valuable insight into testing and developing solutions. Sigfox U.S.A. is the U.S. network operator for the global IoT public 0G network provider, Sigfox, designed to connect billions of devices to the Internet while consuming as little energy as possible. Sigfox U.S.A. offers IoT connectivity through its nationwide deployment, currently covering 24 of the top U.S. metros and 30 percent of the U.S. population. With ongoing network densification, Sigfox U.S.A. is continuing to extend coverage in key regions and offers Connectivity as a Service for connectivity in areas not yet covered. Sigfox U.S.A. is headquartered in Boston with offices in Dallas and San Francisco. For more information go to www.sigfox.us.